Lauren Mullineaux’s research group studies a side of benthic organisms (animals that live on the seafloor) that until recently has received little attention. These marine animals, which include tube worms, shellfish such as mussels and clams, and gastropods such as snails and limpets, have two distinct life cycle phases. We are mostly familiar with the adult phases, but most of us would be hard-pressed to recognize the equally important larval stages, which look nothing like the adults. Unlike the adults, which lie on the seafloor, these microscopic larvae rise up into the water column and drift in the currents for weeks, months, or even years. They eventually settle to the seafloor, and if the conditions are right, develop into adults. Lauren and her group are investigating how these microscopic larvae are able to find suitable habitats and then colonize them. Looking through the porthole of ALVIN. Photograph taken by the ALVIN Group. Some of the most fascinating habitats they are investigating are the hydrothermal vents on the deep ocean floor. These vents are home to animals such as clams, mussels, limpets, and tubeworms that can survive nowhere else. But these homes are only temporary. 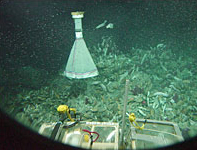 Hydrothermal vents remain active for a limited amount of time, perhaps ten to fifty years. When an old vent becomes inactive, the organisms must somehow find new vents to colonize. To learn how the larvae disperse to new vent sites, Lauren and her group have dived in submersibles to vents thousands of meters deep. There they have sampled and collected larvae, measured the currents that carry the larvae away, and set up experiments on the seafloor where the larvae settle down in order to determine which factors may influence the larvae’s survival. These experiments include transplanting substrates on the seafloor from one type of environment to another and putting down cages to exclude predators. They are also collaborating with colleagues who are placing the larvae in pressure vessels and studying the larvae’s behavior and metabolism in order to learn how long the larvae can survive in the water column. Lauren and her group are also studying shellfish larvae in commercial shellfish beds along the coast. In many shellfish populations, the larvae only successfully settle down and develop into adults every two or three years. This unpredictability has made managing these shellfish beds difficult. Lauren and her group are trying to figure out what environmental factors affect the recruitment and survival of the larvae. This information should help managers predict how the shellfish populations will vary from year to year. Get more info on Lauren's background. See images of Lauren at work. See Lauren's typical work week. Other sites related to Lauren's career.